Jon, I would love to see YoY numbers since 2015 for the 737 (-7,-8) vs the A320’s not including the A321 count. The real action here on the 737 & A320 lines is between the -800 and A320 model jets, and their immediate successors, the MAX 8 and the A320neo. The -800 is the single most successful airliner model airliner, accounting for over half of all 737’s built. We don’t know if history can be a reliable guide of what will happen between the MAX 8 & A320neo, but it certainty looks like two very powerful competitors at each and every sales campaign. At this point of the narrowbody re-engining campaigns, it is clear that Boeing expended quite a bit more effort on their upgrade to restore the status quo to where it was on the Next Generation -800 vs A320ceo. Jon (FYO) or just for fun and congratulations on your blog. 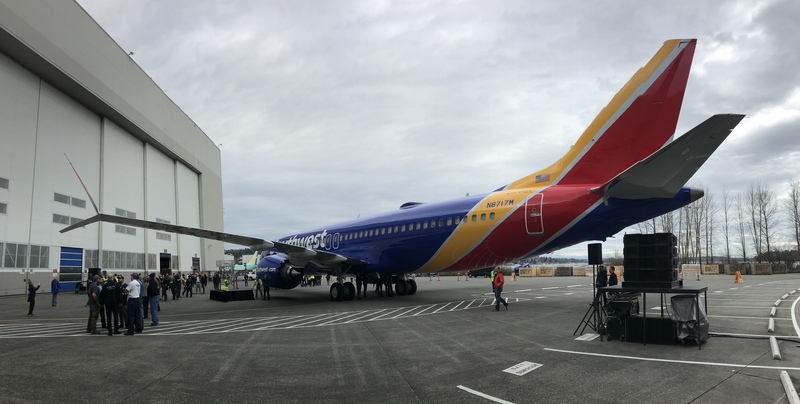 I would’ve liked to have seen WN celebrate this on the livery, even if it’s as simple as WS’ 100th 737NG. Is it really something to celebrate? A granny wearing a tank top and pigtails. Boeing had and squandered many opportunities to replace the 737 with a modern, more efficient and quieter model, one with greener, simpler manufacturing techniques and also corresponding MRO savings that one finds on the 787 and A350. I suspect that the unions had some role to play as modern composite jets needs different, less labour intensive efforts. PS; when I fly, I purposely avoid any 737 and look for a 320 and in the future a CS, due to the cramped seats found in a 737. And… the seats have nothing to do with Boeing. It’s the choice of the respective airline. Blaming Boeing for your seats is like blaming the airline for what your neighbor is wearing. And the cost of your ticket, on average, contains less than $6 towards the cost of the plane: decisions are made by airlines with regards to fleet continuity, cost to operate and repair, service and parts availability, and so forth, with fuel being the #1 factor in your cost. 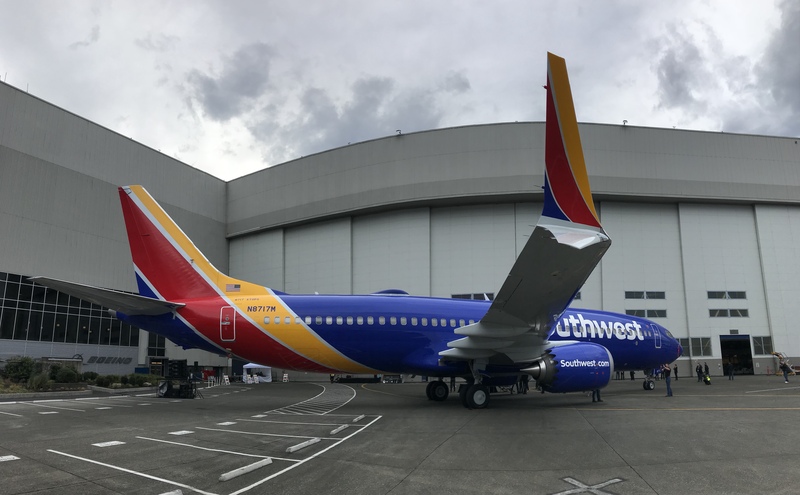 WN, the largest single 737 customer, celebrates that fact and continues to order. You are certainly entitled to dislike the 737s you fly, but your blanket dismissal of them is certainly not reflected in sales or success. But if it were not for the cramped seats that allow extra rows to carry 6 more pax each, would the remakes of the old 737 be efficient enough with only newer engines and wing mods to please airline executives ? Do those airlines buying A320s or EMB190s provide an all-around more progressive product while also allowing that precious 1 inch more of seat pitch ? True, airlines make the seat type and pitch selections, but I don’t see any airlines adding luxurious lounges to these new 737s in the way that the L1011 and DC-10 aircraft of the mid 1970s had lounge bars (aka empty space) in the days before MBA dominance and the fuel crisis, when we all flew at a few hundredths of a mach number below the barber pole and transcontinental trips were 30-45 minutes shorter than they are today ! Nothing is more dreadful than ATL-SEA in the winter, fighting the jetstream at M0.76/FL310 in a 737-900 for 5 1/2 hours. Compare that to the early 707 and CV990 speed records. Agree completely. Putting trendy blue lights in the ceiling of a 1960’s airframe doesn’t make it better. Putting in cramped toilets into it only adds another row of seats, which only pleases airline corporate MBAs. Nice to hear again from you, Jon. After Ben Sandiland’s passing out, there were so few references for aviations geeks like me, I’m happy that you are back with a Blog. Missing that time with the Flightblogger. Agreed, I was an old flightblogger fan as well. Glad to see Jon in his own space again.